Last major update issued on November 7, 2005 at 05:10 UTC. The geomagnetic field was quiet to unsettled on November 6. 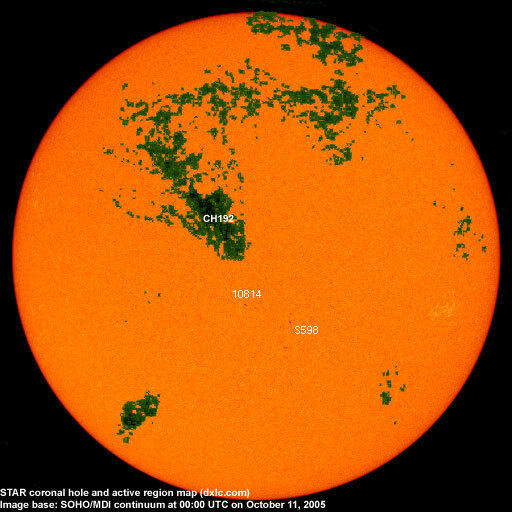 Solar wind speed ranged between 575 and 695 (all day average 601) km/sec under the influence of a high speed stream from CH195. Solar flux measured at 20h UTC on 2.8 GHz was 81.7. The planetary A index was 10 (STAR Ap - based on the mean of three hour interval ap indices: 9.8). Three hour interval K indices: 33222232 (planetary), 42233322 (Boulder). At midnight there were 4 spotted regions on the visible solar disk. The solar flare activity level was low. A single C class event was recorded during the day. Region 10819 was quiet and stable. 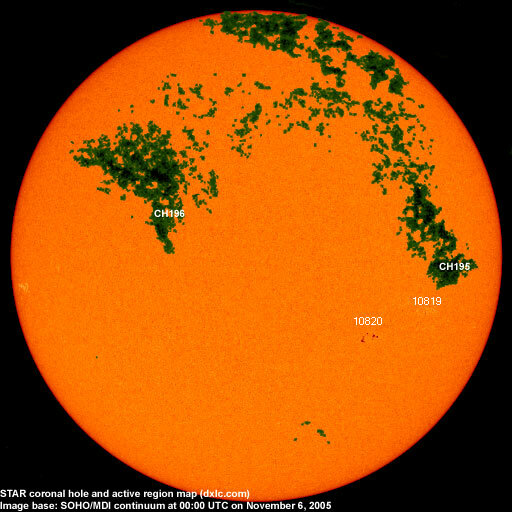 Region 10820 decayed slightly but could produce further C class flares. 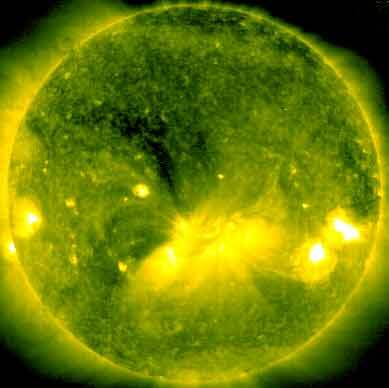 Flare: C1.1 at 14:43 UTC. [S602] This region emerged in the southeast quadrant on November 6. Location at midnight: S06E04. [S603] A new region emerged in the northeast quadrant on November 6. Location at midnight: N05E16. 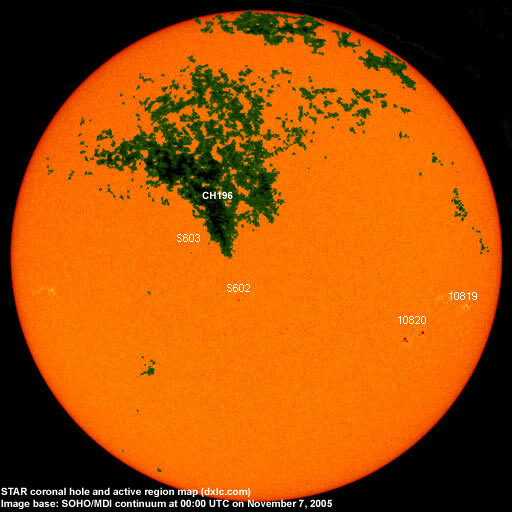 November 4-6: No obvious fully or partly Earth directed CMEs were observed. 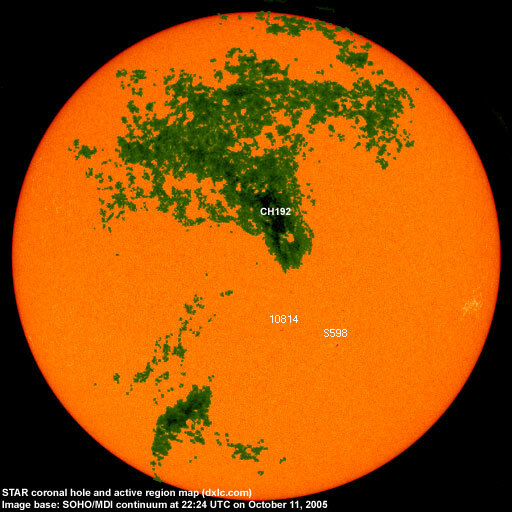 A recurrent coronal hole (CH196) in the northern hemisphere will likely be in an Earth facing position on November 7-8. 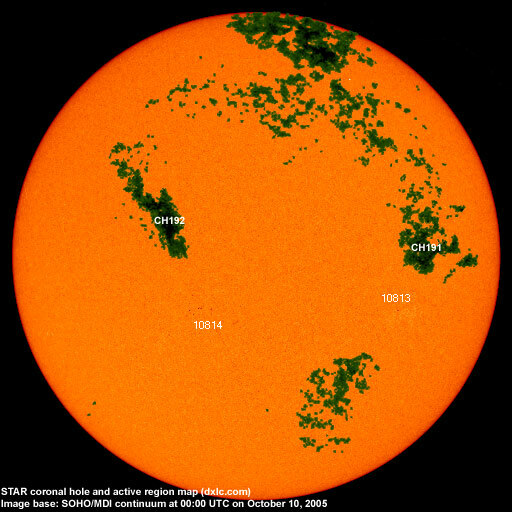 The geomagnetic field is expected to be quiet to unsettled on November 7-8 and quiet on November 9. A high speed stream from CH196 could cause unsettled to active conditions on November 10-11. Long distance low and medium frequency (below 2 MHz) propagation along east-west paths over high and upper middle latitudes is poor. Propagation on long distance northeast-southwest paths is fair. Trans Atlantic propagation conditions are normally monitored every night on 1470 kHz. Dominant stations tonight: Radio Vibración (Venezuela).